Learn how to easily use birding apps without it getting in the way of birding. Sibley’s, Merlin, iBird Pro, and eBird are the apps we will talk about and practice using. Cost: $10 donation to KBO. Meet under the covered gazebo at North Mountain Park. Bring your lunch, binoculars and don’t forget your phone! Email shannonrio@aol.com to sign up or if you have questions or just come. Shannon’s phone: 541 840 4655. 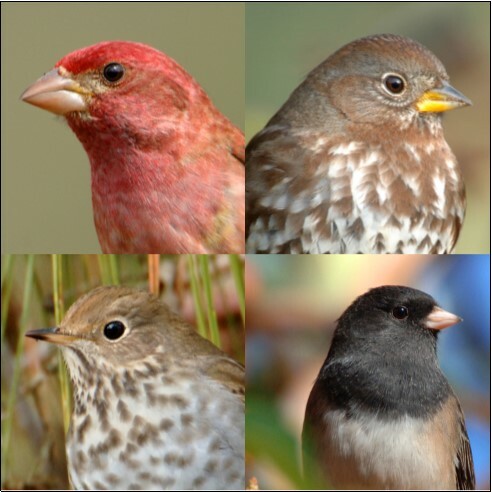 Clockwise from top left: Purple Finch, Fox Sparrow, Oregon Junco, and Hermit Thrush are common birds that inhabit Ashland’s riparian areas during winter. Riparian (or streamside) habitats are critical for water quality and wildlife. These habitats filter pollutants from runoff, stabilize soils, provide shade to cool water temperatures, and much more. They are also known for their biodiversity, supporting the most diverse bird communities of any habitat type in arid and semi-arid regions such as ours. This is even more pronounced in urban landscapes. Some of our most at-risk bird species require riparian habitats for breeding. 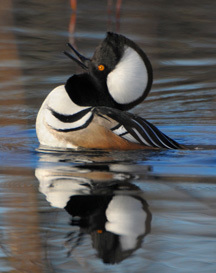 Many species also need healthy riparian habitats during the fall and winter seasons, when they complete important activities like refueling during migration, replacing worn feathers (molting), or building reserves for the next breeding season. Most of our western riparian habitats have been lost or degraded due to human impacts. However, restoration efforts are helping to return these areas back to more functioning natural conditions. 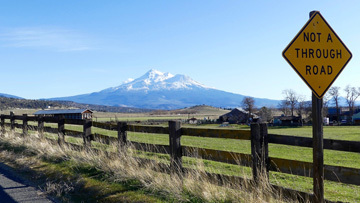 For nearly two decades Klamath Bird Observatory, Lomakatsi Restoration Project, and Ashland School District have partnered on a riparian restoration project at the Willow Wind Community Learning Center along Bear Creek in Ashland, Oregon. 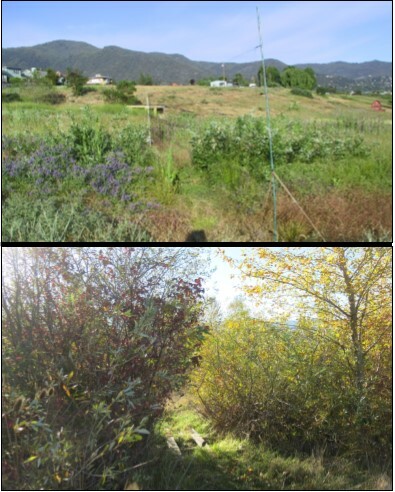 Bird monitoring location at Willow Wind in the early phases of restoration in 2002 (above), and after restoration in 2018 (below). Lomakatsi works to improve riparian habitat in our region by planting a wide diversity of native vegetation, removing invasive plants, and supporting the natural regeneration of native plant communities. As part of the project at Willow Wind, over 3,000 native trees and shrubs have been planted by Lomakatsi’s restoration workers, school groups, and community volunteers. This work has increased the size and health of riparian areas that cool and clean our water, while also providing important bird habitat. Abundance of 7 wintering bird species in restored riparian habitats at Willow Wind. Their numbers increased over time, an indication that restoration is increasing healthy riparian habitats along Bear Creek. KBO has studied birds as indicators of habitat quality at Willow Wind over the past 18 years to monitor the effectiveness of this streamside habitat restoration. The abundance of several bird species that use riparian habitats during the winter has increased over time in areas where Lomakatsi implemented restoration efforts. 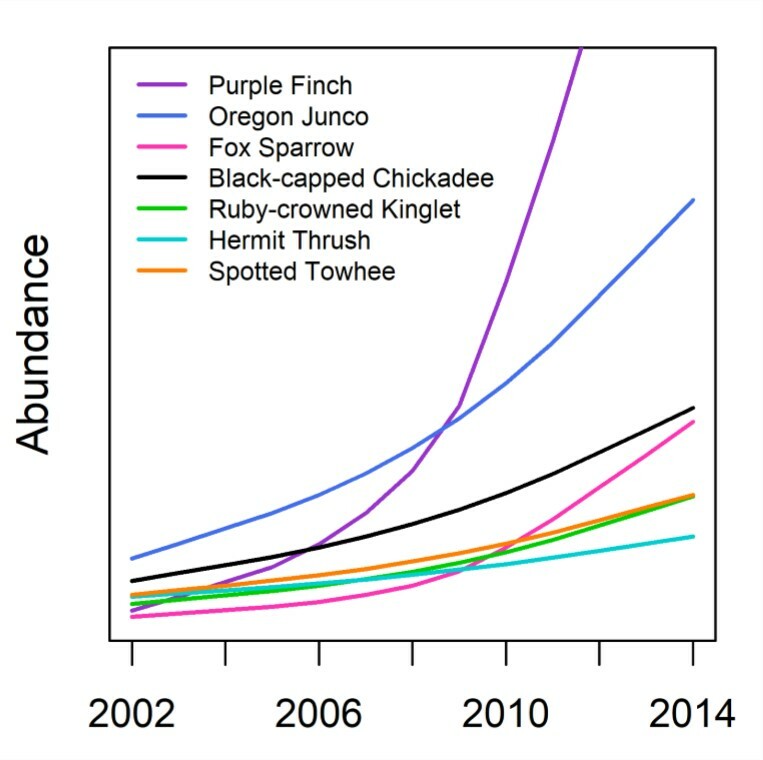 The abundance of these same species changed less in areas where no restoration occurred. Before restoration actions took place, the fall bird community at Willow Wind was substantially different than that of nearby mature riparian habitat. In the restored areas, the fall bird community is now becoming more similar to the bird communities in mature riparian habitat along Bear Creek, as a result of the regrowth of native plants. Restoration actions are improving riparian habitat quality in areas where it had previously been degraded. CLICK HERE to see the full brochure describing results of this project, or to download a printable pdf version. 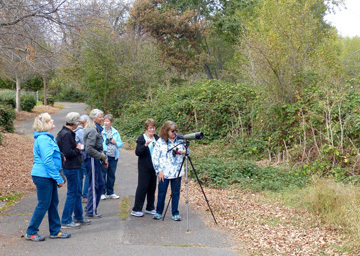 Interested in birdwatching in some of Ashland’s riparian habitats? Try Lithia Park, Ashland Ponds, Emigrant Lake, or North Mountain Park. CLICK HERE to learn about these and other biding hot spots in and around Ashland. Just one hour away from Ashland is the glorious Shasta Valley. Shannon will give a presentation on the landscape and the birds of that area. Frank will then lead the all day field trip. Frank Lospalluto likes to go birding with his dog Violet. Shannon Rio is a wildlife educator and President of the KBO board. COST: $25.00 donation to KBO. Class limited to 16 people. To sign up, contact Shannon at shannonrio@aol.com or call her at 541-840-4655. This presentation is for the beginning birder who would like tips on using and buying binoculars, how to begin to identify common birds, and, generally, how to get started as a budding birder. Barry McKenzie has been birding over 40 years and loves to help others get started in birding. Shannon Rio is a wildlife educator, president of the KBO board and believer in having fun birding. Cost: $25.00 donation to KBO. Class limited to 25 people. KBO can provide binoculars for outing. Email Shannon Rio at shannonrio@aol.com or call her at 541-840-4655 to sign up. 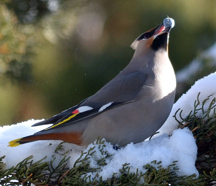 Year of the Bird: December Call to Action-Sharing Your Love of Birds! The Year of the Bird has almost come to an end. As we finish out 2018, the last monthly call to action is about thanks and sharing your love of birds this holiday season with the people in your life. Over the past year, The Year of the Bird has focused on planting native plants, avoiding plastic, participating in community science, making your home bird-friendly, and many more ways to help bird populations around the world. Thank you for participating! During this holiday season, share the ways you love birds with those around you. This could be done in many forms, such as taking someone on a bird walk, sharing birding photography, gifting a bird-related present, or donating to a conservation group. 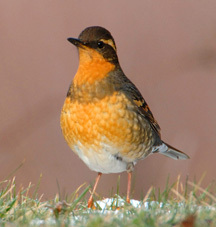 Although the year is coming to an end, supporting healthy bird populations should not. End this year by sharing with others the joys birds bring to you. 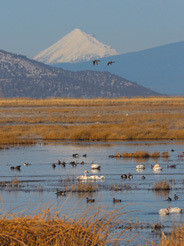 CLICK HERE to visit Klamath Bird Observatory’s website to make an end-of-the-Year of the Bird Donation. 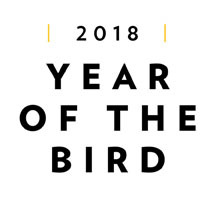 CLICK HERE to learn more about the Year of the Bird. 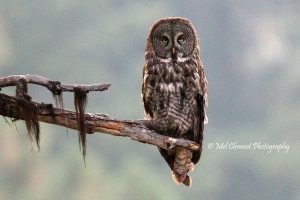 BIRDING PUGET SOUND IN THE PACIFIC NW EXPEDITION IN MARCH! This birding trip will focus on wintering birds of the Puget Sound region that spend the summer in nesting territories further north. The group will visit many birding hotspots at some the most beautiful areas of the Pacific Northwest (maybe the world!). Our birding begins at the Billy Frank Jr. Nisqually Wildlife Refuge. From there we will proceed to Lacey to our motel and dinner. Glaucous-winged Gull, Varied Thrush, Common Merganser, Hooded Merganser, Northern Pintail, Bufflehead, Pileated Woodpecker, and both Golden-crowned and Ruby-crowned Kinglets are likely birds on this first day. Proceed north on US 101 to bird along Hood Canal. Lunch at Hama Hama Oyster Saloon. We will make stops at various parks and overlooks along the canal which is actually a natural, narrow finger of ocean reaching down from the top of Puget Sound complex. Birds we should see include Red-breasted Merganser, Brant, Common and Barrow’s Goldeneye, Red-necked and Western Grebe, Common Loon, Bald Eagle, Pelagic Cormorant, Pigeon Guillemot, Long-tailed Duck, American Black Oystercatcher, Belted Kingfisher, various gulls. Dinner and overnight in Sequim for next two nights. 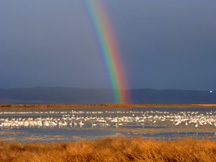 Birding on upper Olympic Peninsula including Ediz Hook in Port Angeles Harbor and Dungeness NWR in Sequim. Target birds for the day: flocks of Harlequin, floats of Rhino Auklets, Trumpeter Swans, Red-throated Loons, more Long-tailed Ducks, all three scoter species, Brandt’s Cormorant. Dinner at Sequim restaurant. We will take the ferry from Port Townsend north to Whidbey Island, thence north to Skagit Flats. Possible birds today include Rough-legged Hawk, Gyrfalcon, Short-eared Owl, Trumpeter Swan, Snow Goose, Peregrine Falcon, Merlin, all three cormorant species … and try for a Yellow-billed Loon which usually shows up along the route each winter. Overnight along I-5 north of Seattle at Marysville. COST: $782.00 per person—includes accommodations for sharing a double room, travel expenses (round-trip travel in large van), and expert birding tour guide for the 5 day, 4 night expedition. Breakfasts will be provided at the hotels we stay at—participants will responsible for other meals (lunch and dinner). Folks are encouraged to bring lunch type foods as we will eat outdoors while we are birding. 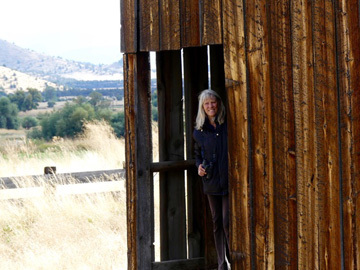 $200 of the cost is a tax deductible contribution to the Klamath Bird Observatory. Contact Shannon Rio at shannonrio@aol.com or by calling 541-840-4655 if you are interested in signing up or if you have questions. October Global Big Day Results Are In! And by the way, you might be asking how did Global Big Day in October go? The goal was 5,000 species—and more than 6,000 were recorded on more than 37,000 eBird checklists in just one day! The Cornell Lab of Ornithology would like to thank every participant all over the world. This was the first October Global Big Day ever, and thanks to participation from around the world, more than 6,000 of the world’s 10,000 birds were watched that big, big day—congratulations to us all! CLICK HERE to see a summary of the October 6, 2018 Global Big Day results.